NAPLES, Fla. -- The staff at Books-a-Million didn't know what hit them. In preparation for a Saturday morning book signing with Newt Gingrich, the bookstore printed numbered cards for the first 500 people looking for an autograph from the former House speaker and Republican presidential candidate. The store gave out its first card at 8 a.m. on Black Friday--27 hours before Gingrich was scheduled to arrive--and ran out before he stepped in the door. After that, the Gingrich fans had to fend for themselves. Gingrich spent the two days after Thanksgiving on a campaign swing through Naples, Florida, a wealthy conservative stronghold in the Sunshine State that was, to say the least, extremely welcoming. He started with a Friday night speech to an overflow crowd at the Hilton Naples, where flocks of white-haired seniors who couldn't find a chair opted to sit on the floor for more than an hour watching the speech on a flat-screen TV. When the room filled up a half hour before the event, hundreds of people outside the hotel conference room crowded outside the door, waiting for the hotel staff to look away so they could try to sneak in. "It's a mob scene!" one woman yelled into her cell phone as she tried to push her way through a throng of pastel-clad retirees. Gingrich's face beamed as he walked through the front door into a packed hotel lobby. "I want to apologize to many of our friends who are out in the parking lot," Gingrich said when he took the stage. "This is frankly a much bigger crowd than we expected." 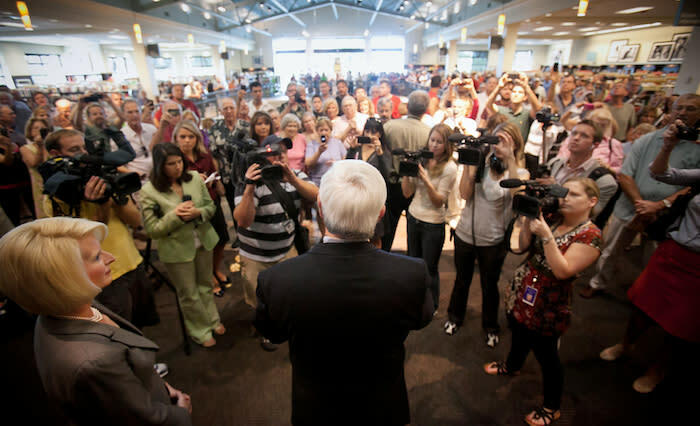 After his speech, during which he took time to clarify his position on illegal immigration, Gingrich hopped over to a $1,000-per-person fundraiser at a city council member's home and then spent four hours the next morning at a Books-a-Million, where he brought in 650 people. After his marathon Books-a-Million autograph session on Saturday, I sat down with Gingrich in a quiet corner of the store where we talked about his run for the White House and a wide range of issues. He spoke candidly about federal drug policies ("I don't think actually locking up users is a very good thing," he said, suggesting instead an approach that would create an array of federal incentives for more effective treatment of drug use). He also explained his position on Cuba, whether he plans to request Secret Service protection and more. Have you learned anything about yourself that you didn't know or that surprised you now that you're running for president? I may be more capable of calm discipline than I would have guessed. Watch the way in which I am methodically not getting engaged in a fight with my friends. Is it hard to resist the temptation? It's getting easier. The more often I do it, the easier it gets. It's easier to not say anything the next time. I'm a natural debater. I've spent my whole career debating. You're drawing larger crowds. Any plans to request Secret Service? We've explored it with them, and I think at the moment I would prefer not to do it as long as we could. I prefer as much as possible to remain open to people. You've been in politics for many decades. Is running for president a different experience than anything else you have done in your political career? No. I've been at this for 53 years. The scale of it is bigger. The intensity of media coverage is dramatically bigger, but not radically bigger than I had in '94 or '95. The freedom to actually develop policies is much greater. I'm not advising somebody else. I'm not reaching out to figure out how to get 350 candidates to sign on at this stage. I'm trying to outline what I think is best. So in that sense it's probably more liberating for me then it might have been. Three Republican presidential candidates have shown an openness to handing over control of drugs and medical marijuana to the states. Would you continue the current federal policy making marijuana illegal in all cases or give the states more control? I would continue current federal policy, largely because of the confusing signal that steps towards legalization sends to harder drugs. I think the California experience is that medical marijuana becomes a joke. It becomes marijuana for any use. You find local doctors who will prescribe it for anybody that walks in. Why shouldn't the states have control over this? Why should this be a federal issue? Because I think you guarantee that people will cross state lines if it becomes a state-by-state exemption. I don't have a comprehensive view. My general belief is that we ought to be much more aggressive about drug policy. And that we should recognize that the Mexican cartels are funded by Americans. Expand on what you mean by "aggressive." In my mind it means having steeper economic penalties and it means having a willingness to do more drug testing. I think if you are, for example, the leader of a cartel, sure. Look at the level of violence they've done to society. You can either be in the Ron Paul tradition and say there's nothing wrong with heroin and cocaine or you can be in the tradition that says, 'These kind of addictive drugs are terrible, they deprive you of full citizenship and they lead you to a dependency which is antithetical to being an American.' If you're serious about the latter view, then we need to think through a strategy that makes it radically less likely that we're going to have drugs in this country. In 1981, you introduced a bill that would allow marijuana to be used for medical purposes. What has changed? What has changed was the number of parents I met with who said they did not want their children to get the signal from the government that it was acceptable behavior and that they were prepared to say as a matter of value that it was better to send a clear signal on no drug use at the risk of inconveniencing some people, than it was to be compassionate toward a small group at the risk of telling a much larger group that it was okay to use the drug. It's a change of information. Within a year of my original support of that bill I withdrew it. Ron Paul and Barney Frank have introduced a similar bill almost every year since. You have to admit, Ron Paul has a coherent position. It's not mine, but it's internally logical. Speaking of Ron Paul, at the last debate, he said that the war on drugs has been an utter failure. We've spent billions of dollars since President Nixon and we still have rising levels of drug use. Should we continue down the same path given the amount of money we've spent? How can we reform our approach? I think that we need to consider taking more explicit steps to make it expensive to be a drug user. It could be through testing before you get any kind of federal aid. Unemployment compensation, food stamps, you name it. It has always struck me that if you're serious about trying to stop drug use, then you need to find a way to have a fairly easy approach to it and you need to find a way to be pretty aggressive about insisting--I don't think actually locking up users is a very good thing. I think finding ways to sanction them and to give them medical help and to get them to detox is a more logical long-term policy. Sometime in the next year we'll have a comprehensive proposal on drugs and it will be designed to say that we want to minimize drug use in America and we're very serious about it. Since we are in Florida, can you provide an idea of how your administration would handle relations with Cuba? I think we need a very aggressive model. I describe it as a Cuban Spring. If you have a U.S. government that says Assad should go, why aren't they aggressively saying Castro should go? We are trying to develop a strategy right now to outline the things we would do in the next two years to try to get the Cuban people to freedom by 2014. Dramatically expand support for independence in Cuba, dramatically expand communications, begin bringing pressure to bear. Try to go to the younger generation of Cubans in Cuba and work with them covertly. Would you open up trade relations with Cuba as president? It's probably not part of it, but I think you would look at under what circumstance would you change and could you offer the Cuban people. For example, immediately after a free election, all the embargoes would drop as of that day. You could have the carrot of saying, the second there's a free election, we should do everything we can to help the Cuban economy flourish. President Obama has opened more air travel to the island. Would you shut down those flights? No, but I would very aggressively move towards maximizing dissent inside Cuba. Mostly covert, and also just subsidies. Go back and look what we did in Poland for example when we aggressively supported Solidarity. What kinds of items would you subsidize? You might try to find a way to give virtually every Cuban a free radio. You might want to try to find a way to maximize your ability to broadcast into Cuba so that you have a continuous alternative model of information. Do you support "wet-foot-dry-foot," the policy that allows Cubans to stay in the United States, but only if they can reach land? No, I think we ought to have some rule that says if you get far enough away from Cuba you've made it. I think it's a terrible thing to say to somebody that you can be within sight of land and that if we intercept you, we're sending you back. Cuba is the last authoritarian dictatorship in the Western Hemisphere, so it's a unique case. On Medicare, in your plan you say that seniors could opt out of the current program and select their own private health insurance provider, with the government helping to cover the cost of the premiums. Is your ultimate goal to migrate seniors out of Medicare entirely? Well no, there would be multiple versions of Medicare. You could have a Medicare version which pays a premium support, you could have a Medicare version which is the current system, you could have Medicare Plus--you could have 12 different versions within Medicare and increase both the competition and the creativity and the innovation, but they'd all be Medicare. On Social Security, you say younger Americans should have the option to put a portion of their contributions into personal savings accounts. Didn't George W. Bush try this in 2005 and fail? What's different now? Why do you think the country would be more amenable to this now? I think it was totally mishandled several years ago. It can't be handled as a partisan issue. If it is a young person's right to choose, one thing we hope to do by next spring is hold debates on campuses across the country and it will be interesting to see if anybody wants to get up on the other side and say to young people, 'No you shouldn't have the right to choose. You should be trapped into a government program even though it has a lousy rate of return.' People who are 25 or 30 today are going to get a terrible rate of return in the current system. It's essentially an income transfer system and there aren't going to be enough people in the next generation to transfer from. Do you think that if you're nominated you'll really get President Obama to agree to your challenge of holding several three-hour Lincoln-Douglass style debates? Yeah, I do. I think he'll look like a fool if he doesn't. How does a guy announce in Springfield, quoting Lincoln? I want to give him a chance to live up to his announcement.